Due to popular demand, we have created a series of spreadsheets and files for all 33 London Boroughs which provide a list of every Postcode each Borough contains. The data is supplied in a single text file containing all Postcodes and boroughs for the whole of london, As the total number of London Postcodes is over 183,000 which is too large for some spreadsheet packages, we also provide the data in 33 separate files - one for each borough. NW10 7BL falls within the Ward of East Acton and the London Borough of Ealing. Alternatively, open any one of the 33 borough files (eg Barnet.csv) and see a list of all Postcodes that fall within that London Borough. For only £25 for the whole of London, this data is perfect for local administration tasks, address analysis and local authority planning. 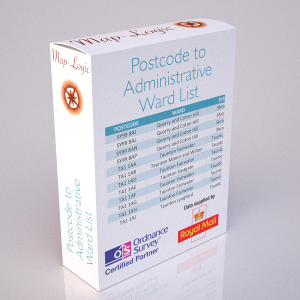 Use within database applications to tag Postcodes with local authority information. The data is sourced from the latest Ordnance Survey Code-Point© Open data and Royal Mail Postzon data and processed to create a single database structure containing a total of 13 data fields for ease of use.